February 28, 1928: Frances Ethel Gumm (Judy) and Alberta Gustoff performed the “Tin Soldier Dance” at the Lancaster Department Store Spring Style Show (aka “Mrs. Wheeler’s Dancing School Style Show”), in Lancaster, California. February 28, 1935: “The Garland Sisters” performed in the “Big Time Revue Vaudeville Night” at the Wilshire Theater in Santa Monica, California. 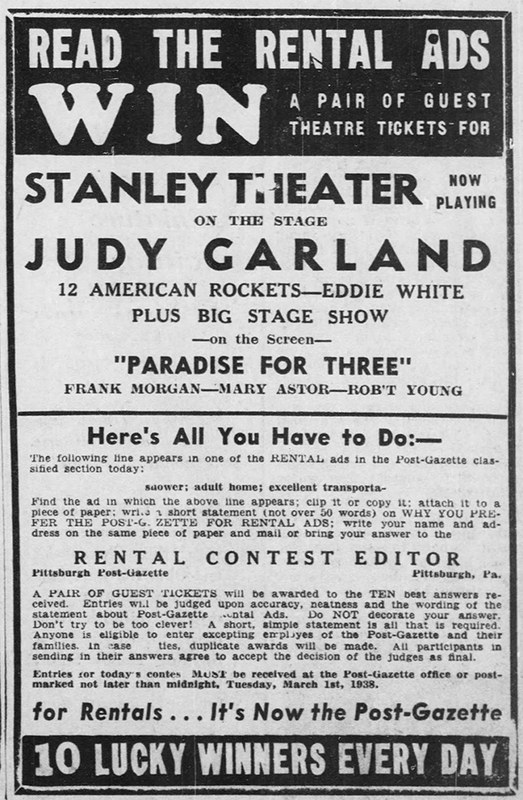 February 28, 1938: Judy’s personal appearance in Pittsburgh, Pennsylvania, (part of her Everybody Sing tour) was a big success as reported in the article above. 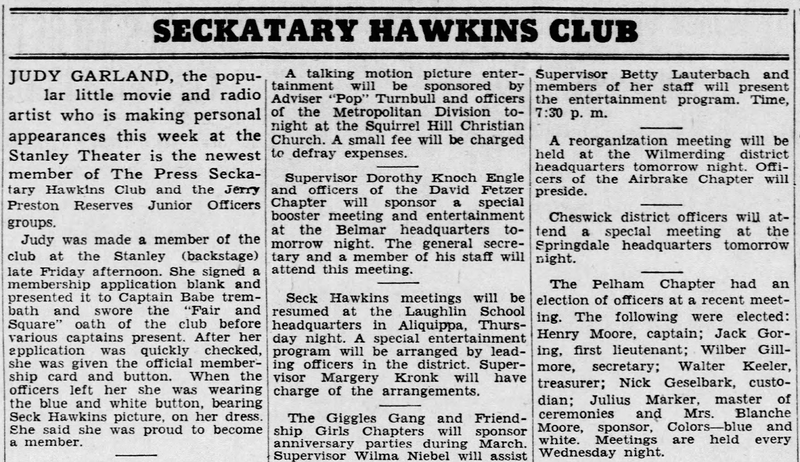 Also above is another article about Judy being inducted into the local chapter of the “Sekatary Hawkins Club.” Also above is an ad for a contest held by the “Pittsburgh Post Gazette” for tickets to see Judy. All one had to do was read the rental ads in the classified section for clues given out daily. 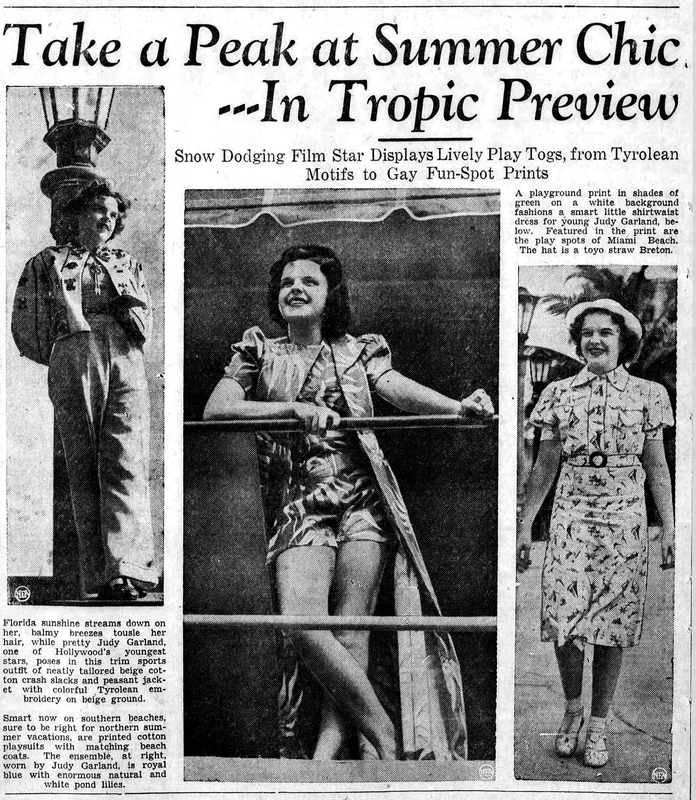 Below, the photos that Judy had posed for in Miami, Florida, in late January were published in various newspapers. 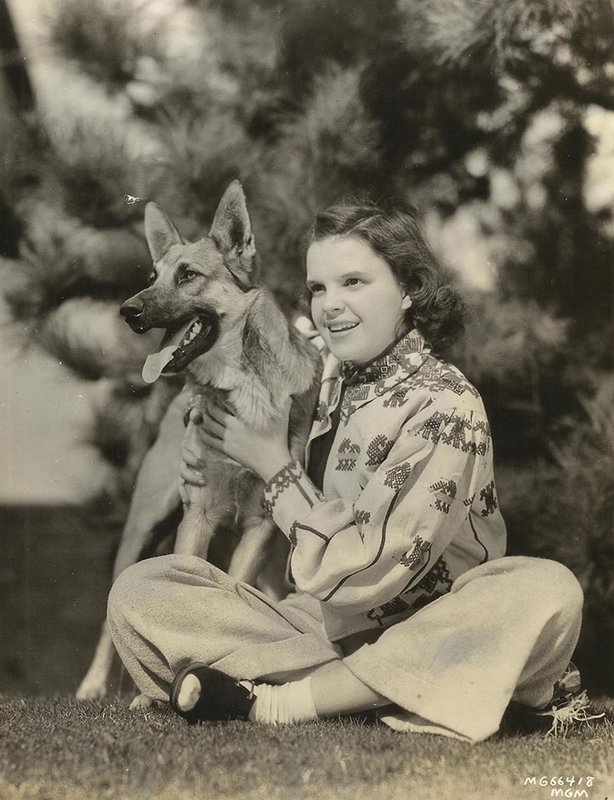 Also included above is a photo of Judy with her dog in one of the outfits but taken back at MGM in Los Angeles, California. February 28, 1938: The recent news (published by “Variety” on February 24th) and Judy had been chosen to star as “Dorothy” in The Wizard of Oz was reported by Louella Parsons. Here are two versions of the same article. 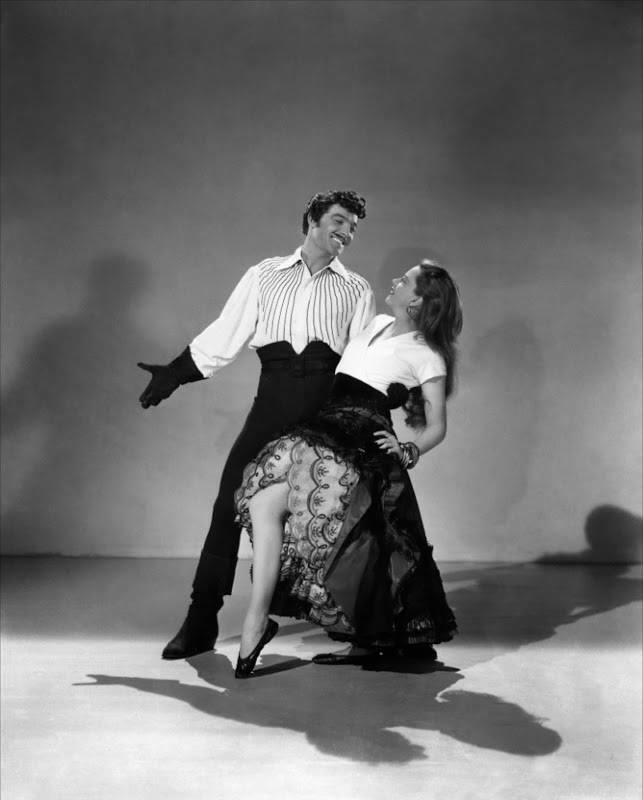 February 28, 1942: Judy had more dance rehearsals for For Me And My Gal. 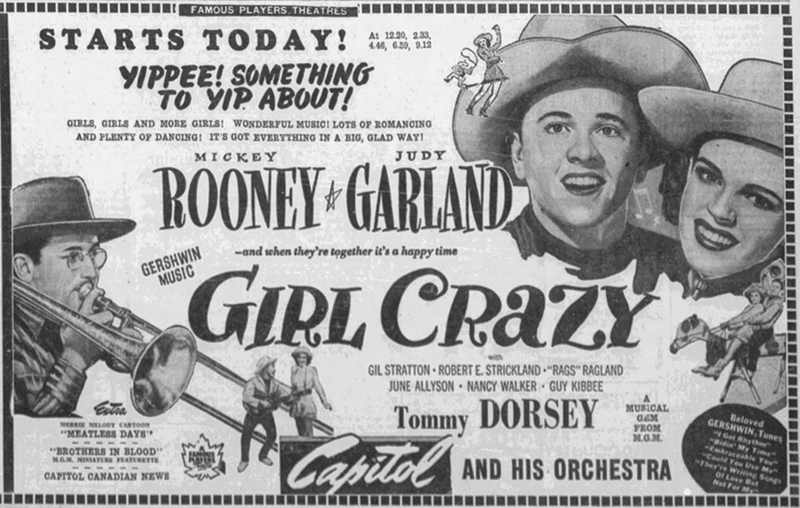 Time called: 1:00 p.m.; time dismissed: 5:00 p.m.
February 28, 1944: This article about Judy’s alleged lifelong ambition to be like Helen Morgan and sing on a piano was published to promote the local engagement of Girl Crazy. However, Judy actually performed on a piano during her vaudeville days, also a la Helen Morgan but the public didn’t know that. 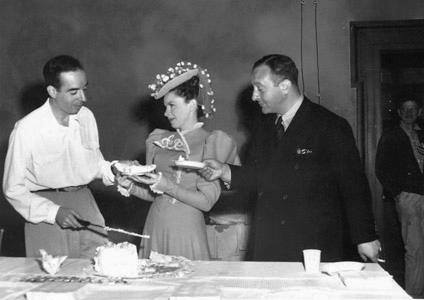 February 28, 1944: This photo (first shown here) was taken on the set of Meet Me In St. Louis. 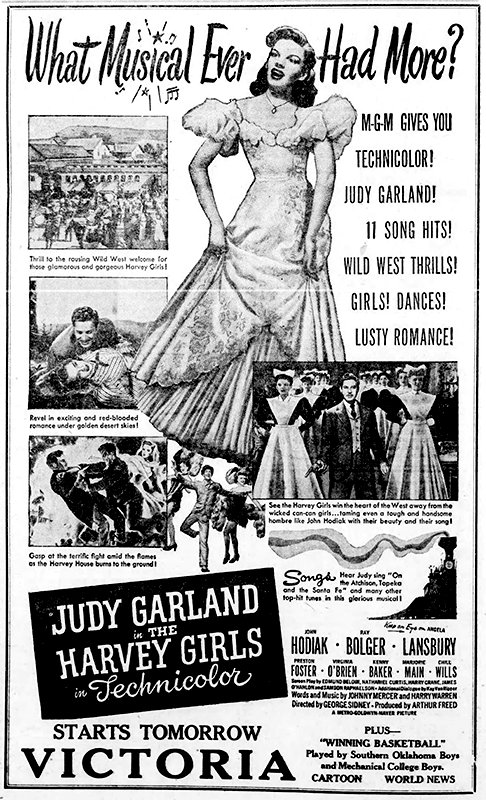 On this day, filming consisted of scenes on the “Exterior Window Children’s Room”; “Interior Upper Hall”; and “Interior Rose and Esther’s Room.” Time called: 10 a.m; dismissed: 4:24 p.m.
After filming, Judy did a photo session for the movie’s poster, along with other publicity shots, with costars Margaret O’Brien and Tom Drake until 6 p.m.
February 28, 1945: Judy was photographed on the Yolanda and the Thief set in her costume for The Harvey Girls enjoying cake with Yolanda director and fiancé Vincente Minnelli, with producer (of both films) Arthur Freed participating. 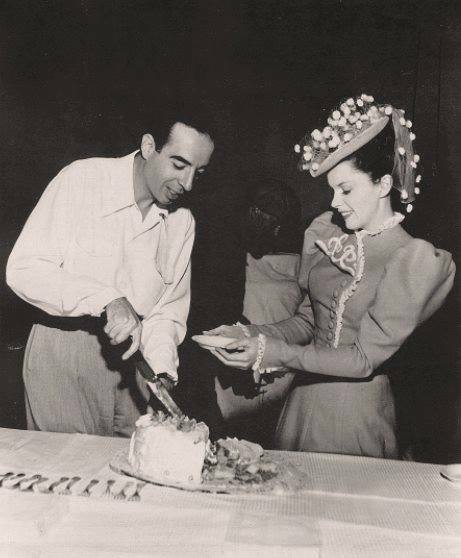 The occasion was the announcement of the Garland/Minnelli marriage. Although the date for these photos is February 28, 1945, the very detailed assistant director’s notes for The Harvey Girls place Judy on MGM’s Backlot #3, the “Western Set” dressed up as “Sandrock” for The Harvey Girls. It’s possible she was on the Yolanda set earlier in the day but per the notes, she arrived on the Harvey set in slacks, not in costume as the photos show. These photos could have been taken on a different day. 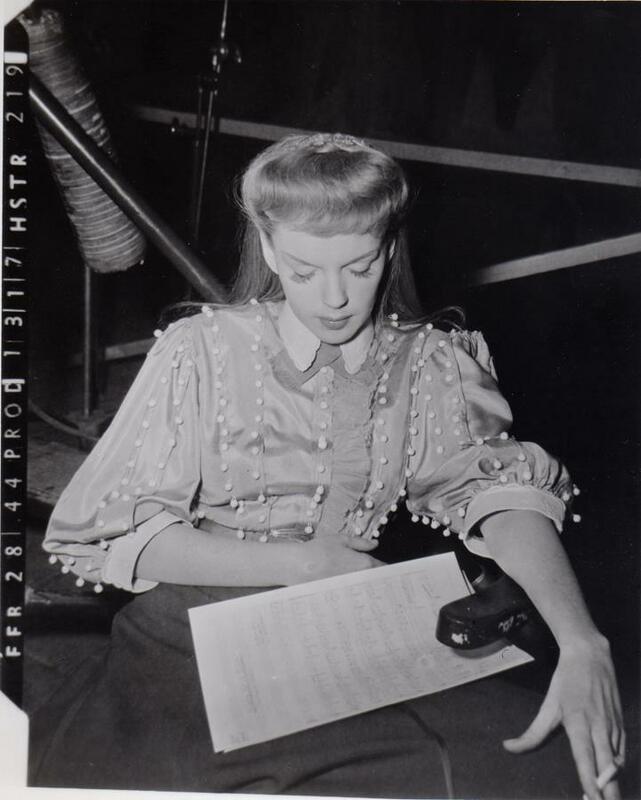 [Judy was due on the set at 3 p.m.] “3:35-3:42: Mr. Sidney [director of The Harvey Girls] discussing scene with Judy Garland who, by the way, is still in slacks and hair not combed out, although she had a 3:00 ready call; she told Mr. Sidney that she was promised the scene would be rewritten and would rather not (shoot the scene) until then. Mr. Sidney then decided to do scene with her and Chill Wills on Ext. Alhambra [the Exterior Alhambra set on MGM’s Backlot #3 “Western Set”]; Chill Wills, who had no call, was phoned for. 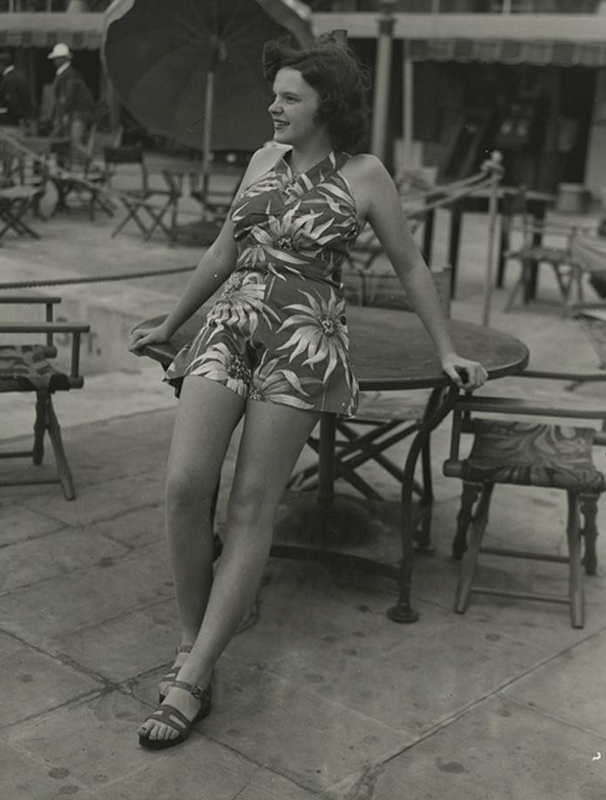 3:45-4:29: Line and Light long shot with Garland and Wills; meantime, Sidney discussing scene above with Garland and Roger Edens; at 4:15 Miss Garland was sent to her dressing room to get ready for scene on Ext. 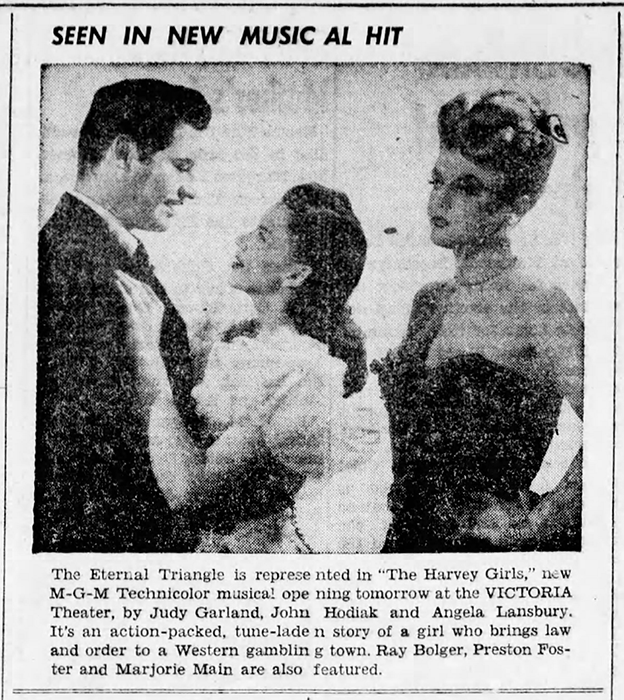 Alhambra; Chill Wills ready at 4:30; 4:29-4:47: Waiting for JG to get ready.” Dismissed: 5:55 p.m.
February 28, 1946: The Harvey Girls was one of MGM’s and Judy’s biggest hits. 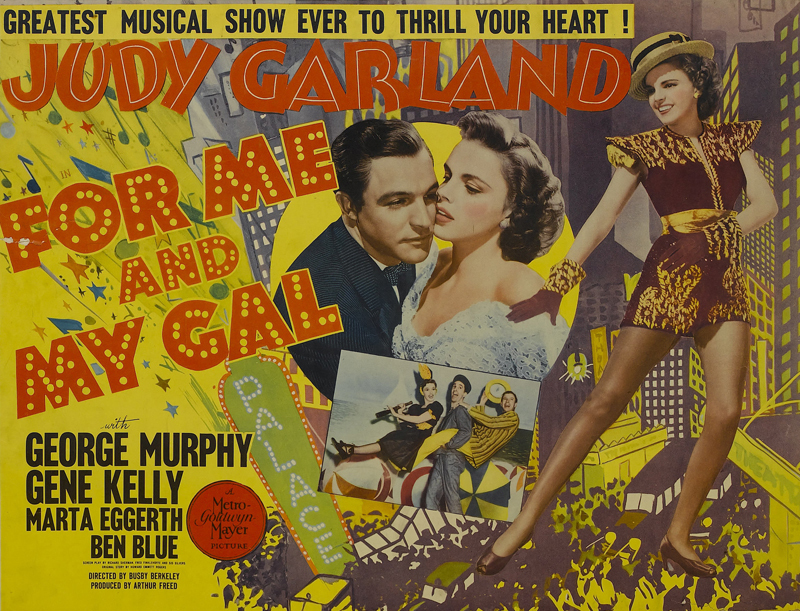 To this day it is still one of Judy’s most popular films and still one of the most popular of all the MGM musicals. 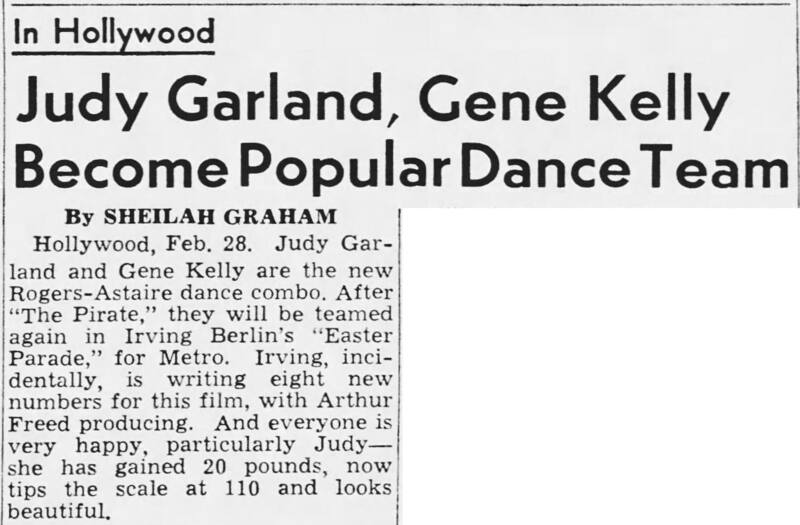 February 28, 1947: Judy and Gene are a new dancing team! February 28, 1952: Earl Wilson reported on Judy’s recent final night at The Palace in New York. 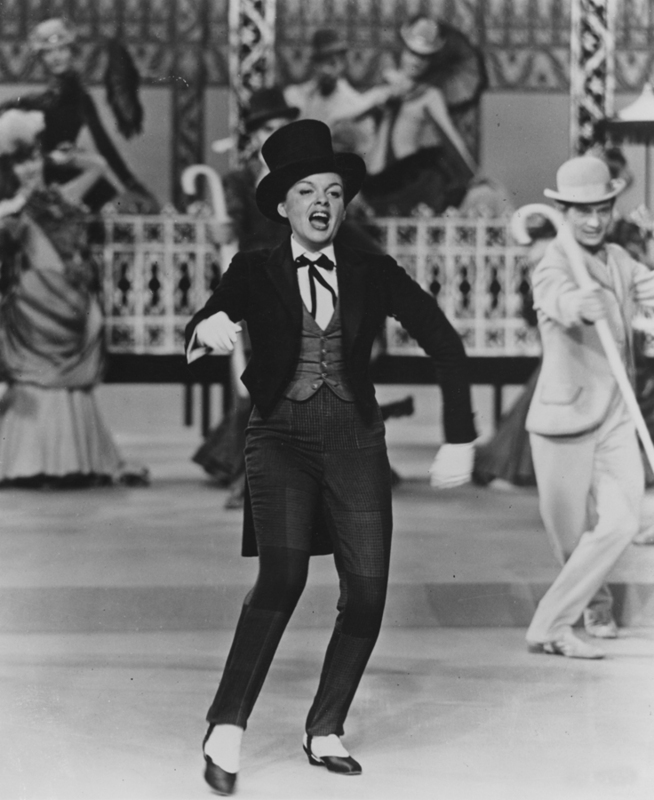 Judy Garland, a human being, has become to Broadway within the past few weeks, a kind of goddess. I don’t use the term recklessly. Today the big news was that Betty Hutton and Beatrice Lillie will eventually follow Judy into the Palace – but Judy’s tingling closing Sunday night, amid tears and shouts like they used to save for Al Jolson, won’t be forgotten quickly by any of us who were there. “What’ll I sing?” Judy asked after she’d sung for an hour. “‘Auld Lang Syne’!” called out some sentimental one. “You sing it to me! I’m tired of singing. 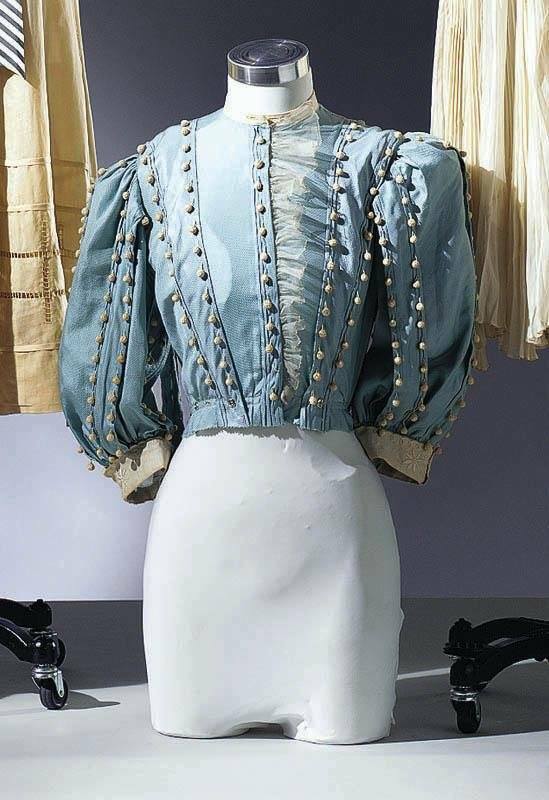 Come on – you sing it to me,” yelled back Judy. And so they did, the whole audience, which had got to its feet in a salute. The celebrities, too – Fay Emerson, Skitch Henderson, Shelley Winters, Phil Silvers – they all sang to the little girl wearing the funny wig and the sloppy shoes. She stood there in a rumpled old wrapper, and with dirt on her face and her cheeks in her hands. She almost held back the tears while they were doing this strange thing – singing to a singer. 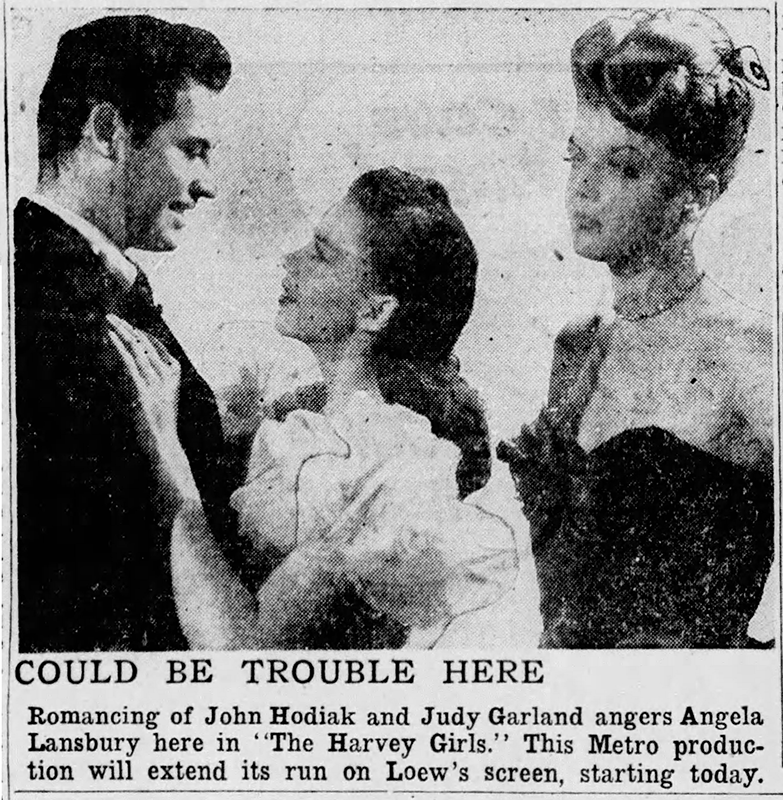 For the first time, Judy introduced her beau and manager, Sid Luft. “They want to meet you too,” she called to him softly from the footlights, and Sid, sitting on the first row, arose bashfully for a bow. It’s believed they’ll be married early in April. 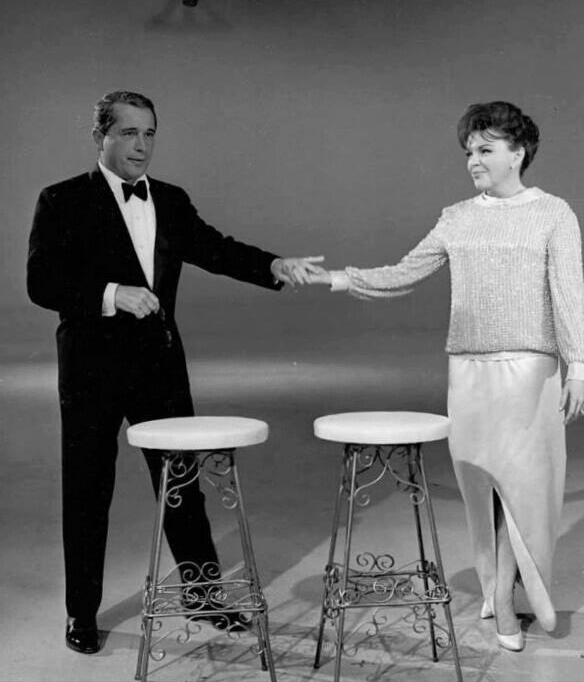 Over twenty weeks Judy played 184 performances to an estimated 280,000 people who paid $800,000 plus taxes. Poor little Judy took about $400,000 of that. 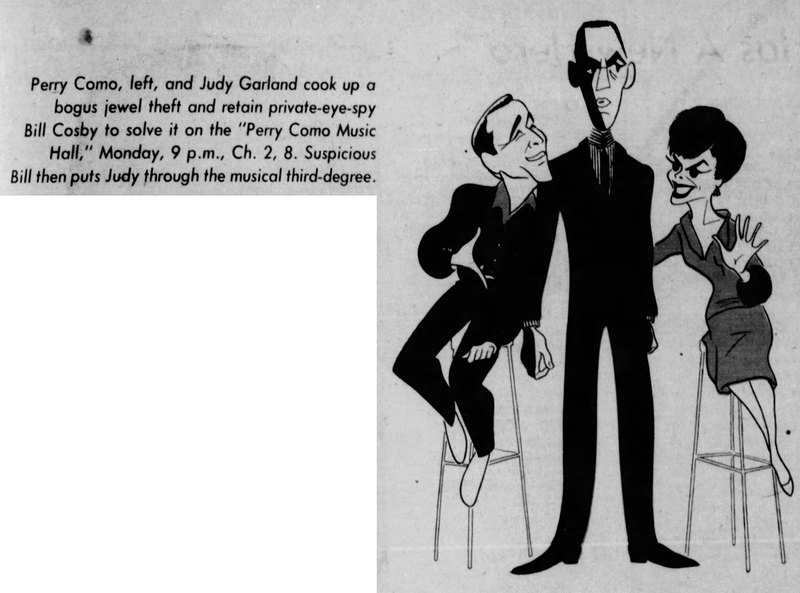 It’s official now that Judy’s as great as – if not greater than – Jolson. You know how I know? There was a hard-bitten professional photographer in front of me. He was so moved by the mass emotional outburst that he stopped snapping pictures, just to applaud Judy. When the tough people in the audiences do that, the race is over. 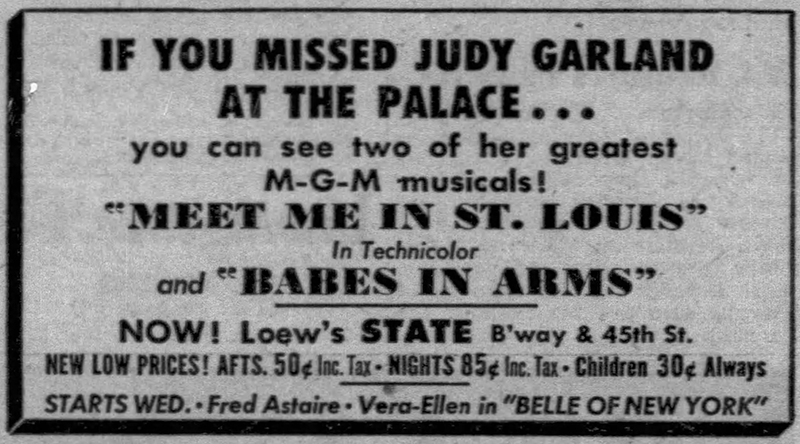 February 28, 1952: Taking advantage of Judy’s astounding success at The Palace, MGM was still having their Judy Garland Festival at Loew’s State Theater. 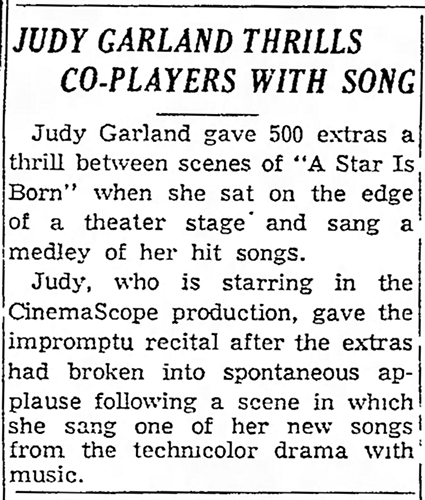 February 28, 1954: Here’s a little blurb about Judy recently thrilling the cast of A Star Is Born by giving an impromptu mini-concert on the set. It most likely didn’t happen but it makes for a good story. 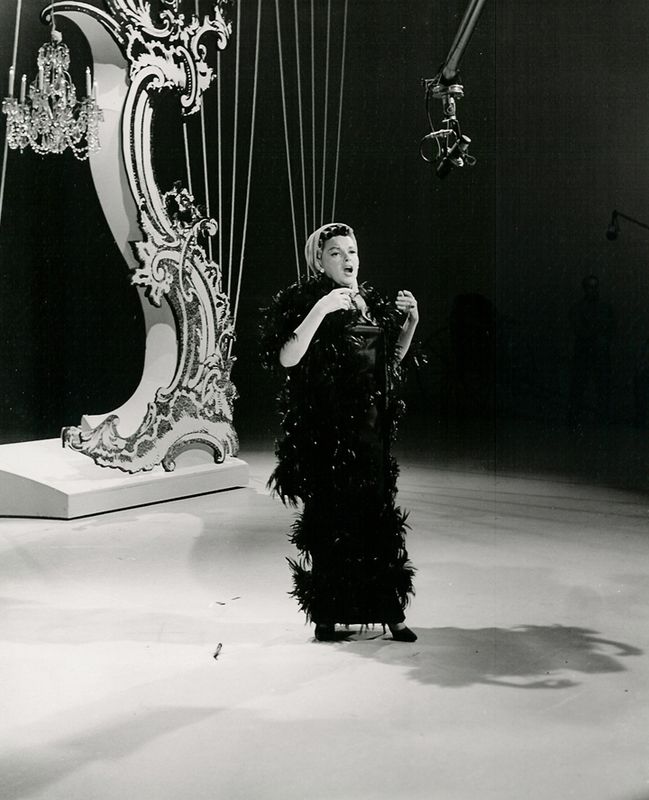 Judy did sing along to her playback recordings while filming and she was known to be able to elicit a response even on a “cold” soundstage so it’s possible she did get some spontaneous applause. 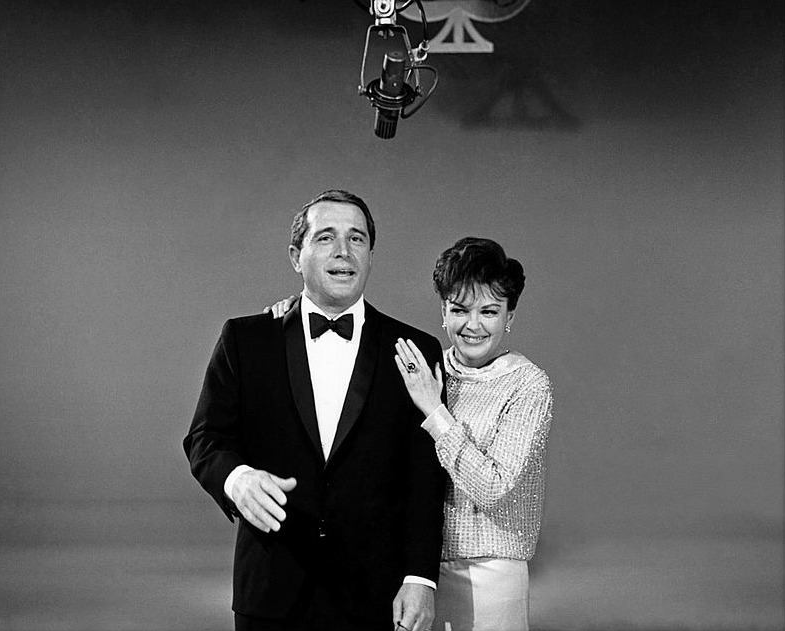 February 28, 1966: The “Kraft Music Hall” aired on NBC-TV, hosted by Perry Como. Judy and Bill Cosby were Como’s guests. 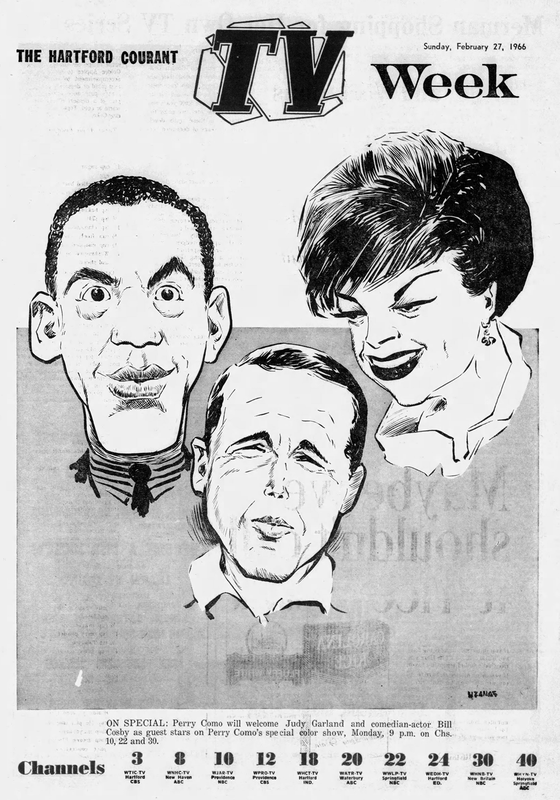 The show was taped in color on February 20, 1966, but all that exists is an inferior black & white print (see below). 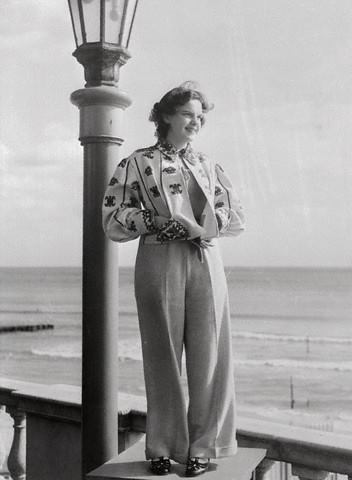 I am constantly amazed at how often the press commented on Judy’s weight. No wonder she had such a complex over her appearance. As always, Scott, your work on these daily columns is magnificent. Today was a rather mild day for events in Judy’s life. Some days there is a ton of information while others are almost empty! Regardless, she had a hell of a full life!